Q: Why can't I connect to a MUD/MUCK server? A: There could be any number of things that might be wrong. Make sure that you are connected to the Internet (obviously you are, otherwise you couldn't read this :) ). Also, make sure you have entered the correct Address and Port number for the server. 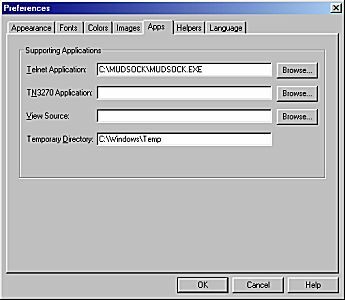 MudSock uses Furry Muck as a default (muck.furry.org port: 8888). Try that and if you get the introductory screen of Furry Muck, then your program is working correctly. Q: I get 'Invalid file format' when I try to run MudSock 1.x. What's wrong? Q: I run Windows/NT and I can't get MudSock 1.x to install properly. A: Unfortunately, the MudSock 1.x Setup program won't work under NT. Go back to the MudSock Homepage and download the MudSock 1.x "Bare-Bones" archive. This is a ZIP archive that contains only the files necessary to run MudSock. However, you'll have to create your own folder and icon for the program (if you use Windows/NT, you probably know how to do this :) ). 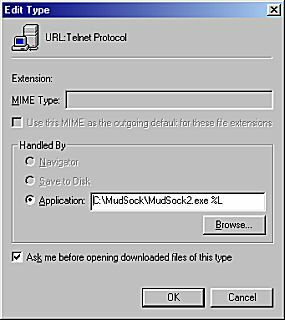 Q: How to I get MudSock to act as my Telnet client in Netscape? 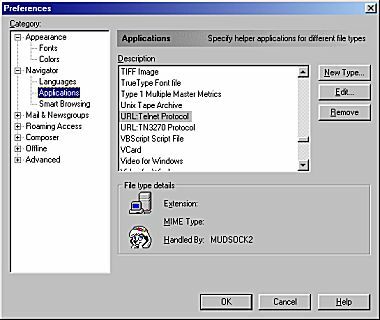 Start Netscape, then click on Options, and then General Preferences.... Click on the Apps tab, then enter the path to your MudSock application in the Telnet Application box (see below). Then click "OK". This should work for all versions of MudSock. Select URL: Telnet Protocol and click on the Edit... button. Another dialog box will appear. In the frame marked Handled By, select the Application radio button. Then enter the path to your MudSock application, followed by a space and "%L" (for "Location") in the Application box (see below). Then click OK. This should work for MudSock 1.2 and 2.x. Q: What is this '[fmcl]' thing I keep seeing in my output? The only other server features MudSock uses are OUTPUTPREFIX and OUTPUTSUFFIX. MudSock sets the output prefix to "[on]" and the output suffix to "[off]" in order to start and stop the lag counter. Q: How do I reset/disable the Lag Counter? To reset the lag counter, just click on it once. To disable the lag counter, double-click on it or de-select "Lag Counter" under View in the Main Menu. Return to the MudSock Home Page.